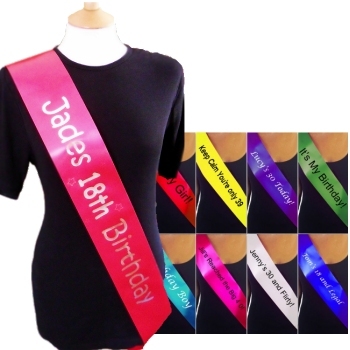 Personalised Birthday sash ribbon the essential party accessory. Personalised Birthday sash ribbon the essential party accessory. Pageant sash with a name and message of your choice. Quality polyester satin face sash with a message of your choice for any celebration. Personalised Birthday sash ribbon the essential party accessory. Pageant sash with a name and message of your choice. Quality polyester satin face sash with a message of your choice for any celebration. Shaped from shoulder to hip standard adult size. Select the text colour, and letter font style. Enter the name or message you would like on the sash. Your personalised sash will be specifically made to order with permanent weather resistant print onto polyester satin fabric.